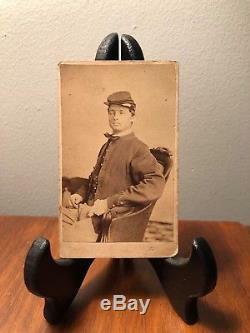 For your consideration is an extremely rare identified carte de visite of an identified wounded Union Civil War artillery soldier. 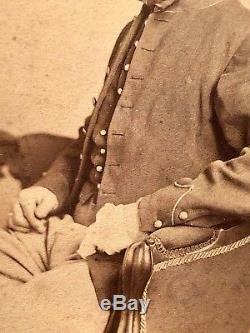 The soldier in question has been identified as a. Slade of Syracuse New York of whom the photograph is addressed to his wife Mrs.
Sylvester is shown to have enlisted in the 1st New York Light Artillery in Baldwinsville in Aug 1861 fighting with the infamous "Petit's Battery" - Battery B. The 1st New York Light artillery is known for its contributions at some of the most intense battles of the war serving. What further makes this image unique is the heavily bandaged hand of Sylvester an additional rarity showing wounding/goring, while proudly donning his uniform. If you should have any more questions or require more photos please let me know and I'd be happy to fulfill your request. Thanks for looking and don't be afraid to leave an offer! 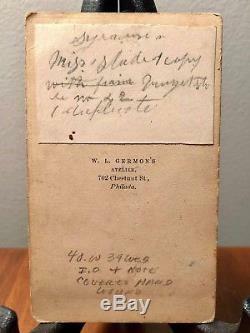 Please feel free to look at some of the other items I have for sale as I specialize in rare and unique pieces ranging from the early 1800s to the Civil War to the early 1900s and to World War Two. Focusing on Militaria Medical and the Photography. The item "Rare Civil War CDV Wounded ID'd Infamous 1st NY Light Artillery Petits Battery B" is in sale since Sunday, December 2, 2018. This item is in the category "Collectibles\Militaria\Civil War (1861-65)\Original Period Items\Photographs". The seller is "strangerthingsantiques" and is located in Georgetown, ON.